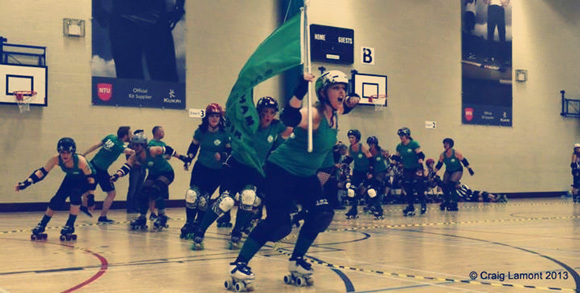 Back at the tail end of 2012, The Ruth Hurts posted with anticipation about what the forthcoming year would hold for Nottingham Roller Girls. Having faced the highs of our first public bout, followed swiftly by the very real risk of the team folding, the good ship NRG had not only weathered the storm, but seemed to be flourishing and was looking forward to the calmer seas of 2013 with a renewed optimism. And I am pleased to say, it has not disappointed. In years gone by, the captain’s log or journal was the daily record of a ship’s course, speed, and significant events, and six months on from Ruth’s post seems a fitting point to not only take stock of our progress, but also to look at what lies in the uncharted waters ahead. The swelling of our ranks has brought an injection of enthusiasm and new ideas to the squad which has manifested itself in a number of delightful ways. It wasn’t that long ago since we were borrowing players to field a bout team, whereas now we have a full squad with reserves waiting eagerly in the wings. With 2 grippingly competitive bouts and a Co-Ed tournament already behind us this year, and with further dates in the diary, the team as a whole have never been so focused. When the new Minimum Skills were cascaded down to us in April, however, there was definitely an audible collective sharp intake of breath. I think it was generally agreed that a number of skills on the old list were massively outdated, and so requirements needed to change to be brought more into alignment with the demands of the game today; a greater focus on speed, endurance and agility can only really be a good thing, right? Consequently, everybody has had to up their game; the bout team have gone right back to basics too (I’m getting there with hockey stops now but it turns out I’ve completely lost the ability to T-Stop. When did that happen?) Looking into my crystal ball, I foresee that team selection is about to get a whole lot more tricky in the not too distant future, with a whole host of highly skilled new players having seemingly taken the changes in their sickeningly agile and graceful strides. Somewhere along the line, sh*t officially got serious. Aaaand whilst I’m on the subject of officials (sorry, I’m all about the tenuous links), we are soon looking to recruit referees. Running for 10 weeks, our Referee Training Course will comprise of a combination of classroom teaching using video analysis, as well as skating skills, with input and advice from consultant referees. So crack out your best colouring pens to draw diagrams a-plenty, dust off your disco skates and follow the whiff of pad stench. We need you!